The history of olive oil begun in Greece about 7000 years ago, when the first olives were transported from the Phoenicians to Greece, and later travelled to the other countries of the Mediterranean. It would be fair to say that the olive oil is in fact the emperor of the infamous Mediterranean cuisine. The olive tree, being the only tree most connected to Greek folklore tradition has endured and continues to do so, under the harshest of conditions. According to Hippocrates, olive oil is considered to be the perfect healer as well as providing the base for the Mediterranean Diet. Its unique flavour, its texture, its organoleptic characteristics, as well as the Omega-3 – known as fat-soluble vitamins – constitute it highly significant. Olive oil, combined with certain other foods may offer a better level of absorption of anti-oxidant and nutritional substances as well as vitamins. For example, the lycopene of the tomato, which is highly anti-cancer and anti-oxidant, may be absorbed more efficiently when combined with olive oil. Vegetables such as green salads, filled with beneficial anti-oxidants and vitamins are fully absorbed by the human organism only in the presence of a fatty substance. In conclusion, this combination offers protection against hypertension and cardiovascular illnesses. The beneficial qualities of the olive oil are numerous and innumerable, with the first and most important being the prevention of cardiovascular diseases and the protection against coronary heart disease, as it contains the well-known Ω3 fatty acids. In addition, it helps to reduce what is known as “bad” cholesterol (LDL) in the blood, helps to better absorb calcium from the body, as well as to better bowel function. Similarly, an important function is to balance sugar levels for the proper functioning of a diabetic organism. Additionally, another beneficial property that deserves to be highlighted relates to how the skin can be revitalised. 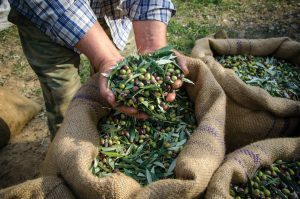 The polyphenols contained in the olives are the substances that help fight cancer, but also offer that original taste. Oleasin and oleic carbon are substances with anti-inflammatory and antioxidant activity, almost as powerful as medication. In conclusion, it is through nutrition and particularly olive oil that components of this significance are provided and help reduce the risks associated with diseases. Used daily. Found in almost every Greek home. Doctors and dietitians place it at the top of the food chain. Clearly, all the glory goes to olive oil and its benefits as accounted for, here below.